The Great Wall of China (万里长城; Wàn Lǐ Cháng Chéng), one of the Seven Wonders of the World is the largest ancient military fortification in the world, and its construction is the longest in history. Its history started in the ninth century BC. In order to defend against the onslaught of northern nationalities, the authorities in central China started making the wall by connecting the existing border towers and fortresses, so gradually a long wall emerged. Later in the spring and autumn period (770-476 BC) and the Warring Kingdoms period (475-221 BC), the rulers fiercely struggled for hegemony, so the wars between them were without ending, and it was impossible to continue the construction of the wall. 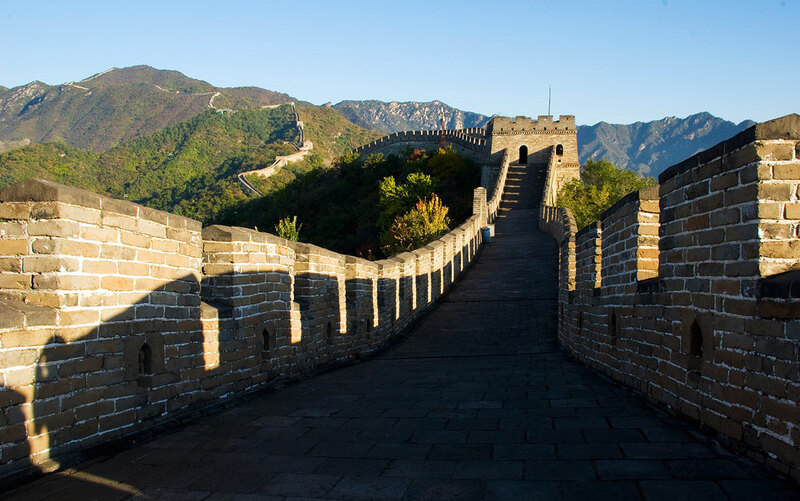 However, the first official order to build the wall appeared in 221 BC by Qin Shihuang, the first emperor of the Qin Dynasty, who unified China and merged the walls of the north of China to form the majestic fortifications in order to defend against attacks by nomadic Mongol cavalry. At that period, the Great Wall of China was more than 5,000 kilometers long. During the reign of the Han Dynasty, which came right after the dynasty Qin, the Great Wall of China extended for more than 10,000 kilometers. In the later period of 2000 years, the rulers of all Chinese dynasties more or less experimented on the Wall of China, but the sections of the Great Wall which survived to these days are mostly restored during the Ming Dynasty (1368-1644). It begins in the west in China’s Gansu Province and ends in the east on the coast in the province of Liaoning. It passes through 9 provinces, and its total length throughout the history was 21,196 kilometers. Over the years it has changed a lot, being additionally built, at times partially collapsed, but nevertheless, it is still standing firmly, being the biggest attraction in the world. Though its main function was to preserve enemies to enter China, the wall did not perform it fully, and the nomads constantly broke through the damaged parts. However, it’s another role serves even today, as the boundary between the two cultures, as well as the boundary between agricultural and nomadic lifestyle. Ironically, the establishment of the trade cooperation and the understanding of the needs of the Mongol people by Chinese emperors could have been even more effective defense than the Great Wall. The secret of endurance and durability of the Wall of China lies in the sticky rice that workers used during the reign of the Ming Dynasty since it served as a very strong mortar. Chinese scientist discovered that this ancient mortar is probably the first composite bonding material in the world, produced from a mixture of organic and inorganic components – amylopectin and calcium carbonate, adding that the amylopectin helped in creating a compact microstructure that allowed the Wall of China to be stable and to have a higher mechanical strength. During the construction of the Great Wall, the inhabitants of southern China protested because the government took all the rice they possessed to feed the workers and build a wall. The Great Wall has a superior historical, cultural and tourist value. In China, it is often said that the person who was not on the wall cannot be evaluated as a true man. And domestic and foreign guests, including leaders of foreign countries, all feel honored to have been able to climb the wall. Today it represents the embodiment of mind and effort of millions of working people in ancient China. It has functioned for hundreds of years but has not dropped yet. The Great Wall of China became the symbolism of blood kinship and national character of the Chinese nation, due to its millennial size and immortal charm of ancient times. There are many interesting facts related to the wall, and one of the most common is the belief that it could be visible from the moon, though it is considered false by the scientists. The wall is called also “the largest cemetery in the world”, as many workers have died in its construction, and allegedly it cost the lives of more than a million people. Nevertheless, the wall is threatened by the destruction if the inhabitants of China continue treating it this way. Exactly 1,962 kilometers of the building is gone because locals sell stolen material from the wall or, use it to build their own houses. The Great Wall of China is inscribed on the UNESCO’s list of World Heritage Sites in Asia and Oceania in 1987. There are about 15 sections of the Great Wall north of Beijing, within a four hours’ drive. Five most popular and impressive sections near Beijing are Mutianyu (70 km from Beijing), Jiankou (73 km), Badaling (75 km), Simatai (120 km), Jinshanling (125 km). There is also very interesting Jinshanling-Simatai hike. Regardless of which section you visit, take snacks and water with you before you climb to the Wall because prices on the Wall are higher. However, don’t take too much water, because it can be a burden during a hike, and on a sunny day’s cold water from stalls is worth extra yuans.